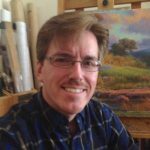 After 37 years of teaching art classes, I will soon be happy to offer an online art course, sharing my experience in painting with those unable to take direct lessons with me. Please click the button to learn more. Realistic and impressionist original art work to refresh your home or office available for purchase. 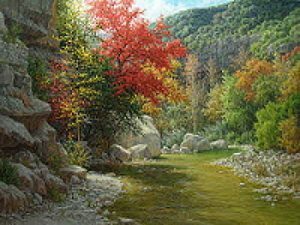 Welcome to the realistic landscape oil paintings and artwork of William Hagerman and Impressionist works by Byron, my alter ego and the signature used for my impressionist work. Subject matter includes realistic and impressionist paintings of the Texas Hill Country, Bluebonnet Paintings, American West, Southwest landscapes, and other beautiful views of the rural countryside. Viewing the variety of landscape oil paintings, will give rise to pleasant moments of contemplation as you view the subtle nuances captured in a moment of time. Being tied to the elements of the earth, we feel drawn to the scenic outdoors, nurtured by it, and rejuvenated as we savor the beauty around us. The essence of my work is to impart these same feelings. Having good taste is appreciating beauty. Creating it is my art. If you haven’t found that “special painting” then a commissioned oil painting may be just the perfect option for you. I invite you to learn more about this great opportunity along with a few other customer testimonials. Learning how to oil paint, can raise many questions such as “where do I start or how do I mix colors?” It can seem like a daunting task for those just starting out and especially without any guidance. However, William Hagerman offers such guidance through his art classes, demos and workshops. Basic art instruction is provided here on this website.